Substance addiction in the United States is widespread, and, in recent years, has become a greatly discussed public health concern. Substance abuse costs the country an estimated $740 billion each year, and it wreaks havoc on millions of lives. But the devastating effects of drug and alcohol misuse aren't only limited to those who ingest the substances – abuse can deeply impact loved ones, colleagues, and many others. For that reason, we investigated how substance abuse affects those who are dating addicts. We surveyed 507 people aged 18 to 72 who were currently in relationships with people suffering from addiction. We asked them when they first noticed their partners' addictions, whether they regretted their relationships, and how addiction impacted the most intimate aspects of their lives. Read on to learn more about how substance use affects relationships across the United States. Although there are addictions to gambling and substances like nicotine to consider, we wanted to analyze dependency to substances such as alcohol and illicit drugs, as well as the abuse of prescription medications, in current relationships. In an initial survey of 1,722 people, nearly 60 percent of respondents had dated a person addicted to drugs or alcohol. 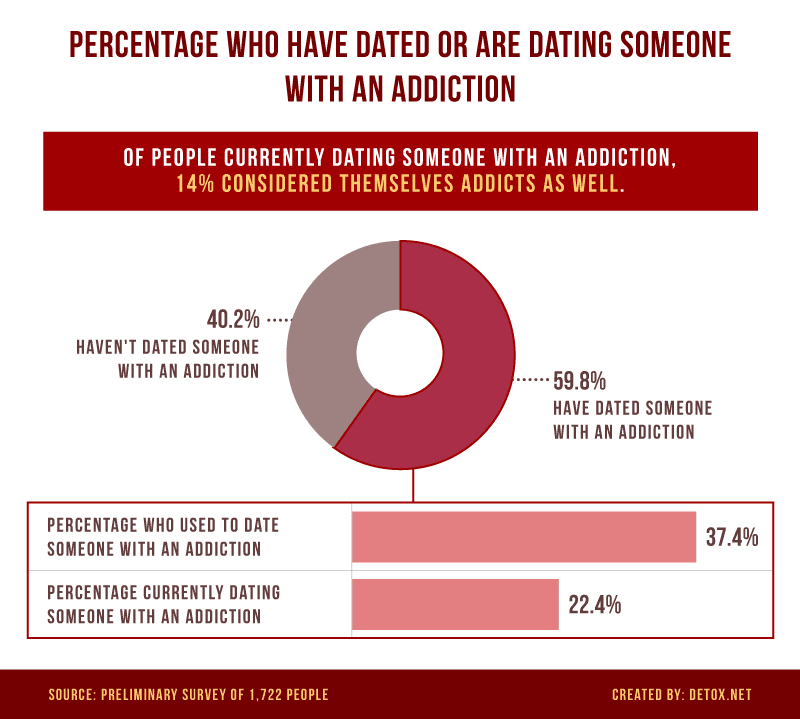 Of the percentage who have dated someone with an addiction, around 22 percent said they were currently dating someone with an addiction, and roughly 37 percent used to date someone with an addiction. Further, 14 percent of those currently dating people with an addiction considered themselves addicts as well. In the U.S., people with substance use disorders have varying addictions. For that reason, we analyzed the types of substances involved in current relationships with addicted partners. 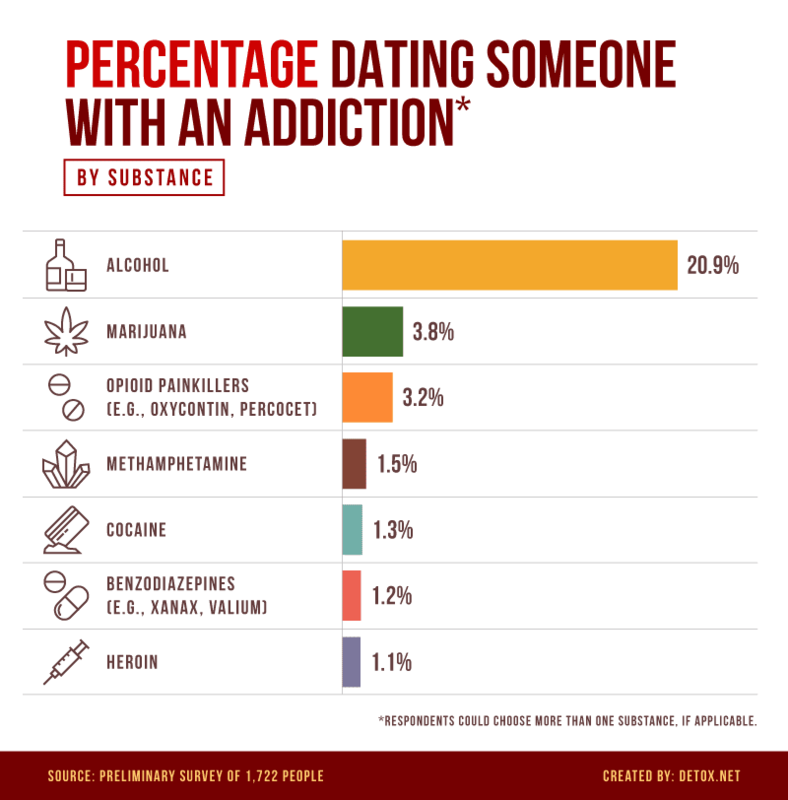 Nearly 21 percent of people reported dating someone addicted to alcohol, while roughly 4 percent of respondents dated someone addicted to marijuana. Despite the growing heroin crisis, only around 1 percent of the sample said they were currently dating or had dated someone who was dependent on this highly addictive and potentially fatal substance. Addiction is a widespread problem in the U.S., affecting as many as 21.5 million Americans aged 12 or older, according to 2014 numbers. But when it comes to relationships, it's possible that romantic partners struggle to identify the warning signs. We asked survey respondents about the moment they first realized their partner had a substance use problem – and what they considered an identifiable sign. When it came to alcohol, almost half of survey respondents noticed a problem within the first six months of their relationship (less than 14 percent saw it immediately). Issues with illicit drugs and prescription medications were also very likely to be identified within the first six months, with about 43 percent of respondents saying they recognized their partner's addiction to illicit drugs, and 54 percent saying they noticed a prescription medication problem. Our data suggest most people discover their partner's substance abuse fairly early in the relationship. The most common signs of addiction included excessive use, daily consumption, and abnormal behavior such as lying, mood swings, and aggression. 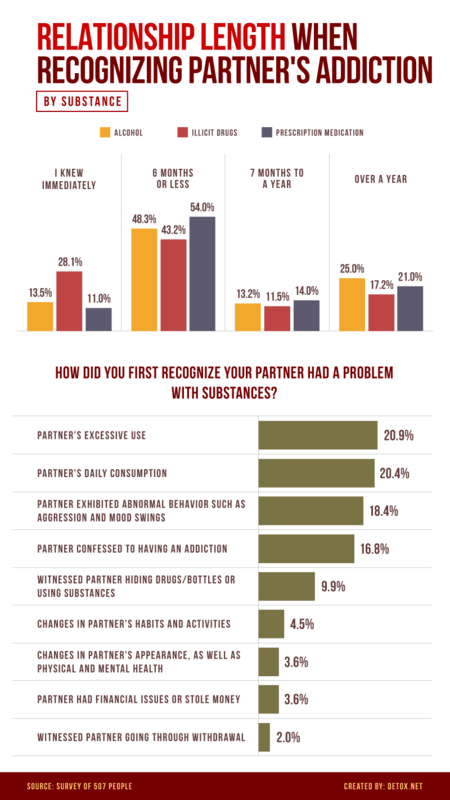 In almost 17 percent of cases, survey respondents learned about substance addiction because their partners told them. There's no doubt that addiction in relationships can take a dark toll on those involved, and understanding how addiction affects individuals involved could be useful to addiction counselors and policymakers alike. We asked both men and women about how their relationships with addicts affected them. Nearly 69 percent of women and over 54 percent of men said it affected their ability to trust their partners. Mental health was the second-most negatively affected part of life for a person dating an addict. Meanwhile, almost 44 percent of women said dating an addict affected their financial stability, along with about 40 percent of men. Addiction also significantly impacted respondents' relationships and emotional availability to others. Dealing with addiction can be emotionally draining, and often the partner without a substance use disorder is burdened with feelings of responsibility. 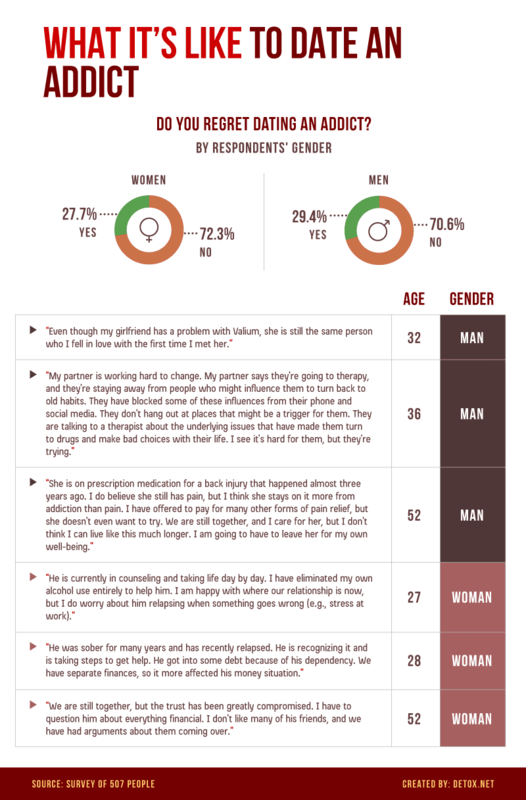 We surveyed men and women about their perceived role in their partner's addiction and whether they thought they could fix their partner's substance use disorder. Men were more likely to feel responsible for their addicted partner's health. Nearly 74 percent of men said they felt personally responsible for their partner's health during addiction, compared to less than 63 percent of women. Men were also slightly more likely to feel they could fix their partner's addiction (74 percent) compared to women (68 percent). 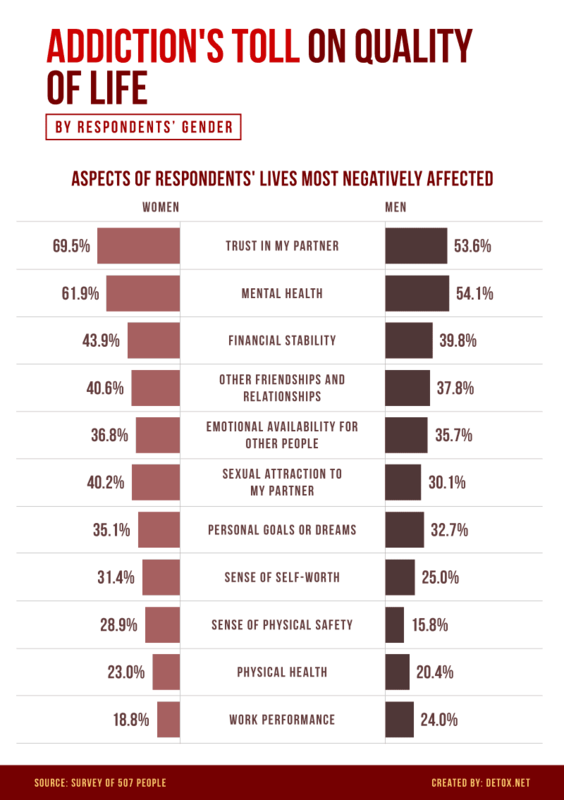 When we asked respondents about their sense of personal safety around their partners, around 40 percent of women and 35 percent of men said they felt unsafe at times because of their partner's addiction. Relationships and feelings of love are very complex. As a result, it's impossible to summarize the impact of substance use on relationships by survey questions alone. We asked respondents to share their stories, thoughts, and reflections on their romantic relationships with addicts and discovered a more nuanced portrait of people navigating love and addiction. For most people in relationships with addicts, over 70 percent of men and women said they didn't regret sticking with them. Although our study shows the toll of dating an addict, it also shows just how responsible people feel for the health of their loved ones. As some of their stories tell, our respondents believed they could be of real help to their partner struggling with substance dependency. Drug and alcohol misuse is a massive and incredibly complicated issue in the U.S. and abroad. More than 20 million Americans battled a substance use disorder, according to 2014 numbers. Substance abuse in relationships can negatively affect both partners involved and, as our study shows, can create a sense of responsibility for the non-addicted partner. However, the journey of detox and recovery can be made easier for both partners, and more effective for the person suffering from addiction, with professional help. For help with substance use disorders, such as alcohol or prescription medication dependency, visit Detox.net to learn more about addiction, treatment, and the steps forward. We initially surveyed 1,722 people who had dated someone with addiction in the past or were currently dating someone with an active addiction. Because this campaign focused on what it is like to date someone with an addiction by substance, we continued the rest of our study by only surveying those who were currently in a relationship with someone they believed was actively addicted to alcohol or drugs. We surveyed 289 women and 218 men. The average age of our respondents was 33 with a standard deviation of nine years. The ages of participants ranged from 18 to 72. This survey was exploratory, so we did not statistically test our hypotheses. Although our survey focuses on addiction to alcohol, marijuana, and other drugs, there are other types of addictions to substances like nicotine and activities such as gambling, but we did not include those in our analysis. Our survey participants ranged from those in relationships with people with medically diagnosed addictions to speculative addictions based on respondents' experiences with their partner's substance use. Want to share these facts and findings related to addiction and relationships? Repost any of the results of this study on your own site for any noncommercial use. We only ask that you include a link back to this page so that our contributors get credit for their work too.